Professor says that international students face lower admissions standards. Do they? After a UBC associate professor argued in a Vancouver Sun column that international students face easier admission standards, the university has refuted his claims. Dr. Peter Wylie, who teaches economics at UBC Okanagan, wrote that since the admissions of international students are considered separately, there may be less demand and therefore less competition for their seats. “... [I]nternational students are able to buy their way into UBC by being in a different admissions stream, paying staggeringly high fees, in a manner that domestic students cannot,” Wylie wrote in the October 30 column. UBC disputed his arguments the following day with an assertive statement. “These claims are not accurate,” said Pamela Ratner, vice-provost and associate vice-president of enrolment and academic facilities. Ratner’s statement shows that admission averages between international and domestic students are virtually the same — 91.2 per cent and 91 per cent this year, respectively. International students haven’t always historically outscored domestic students, but data from UBC indicates the small gap between admissions averages has stayed consistent over the past 10 years. 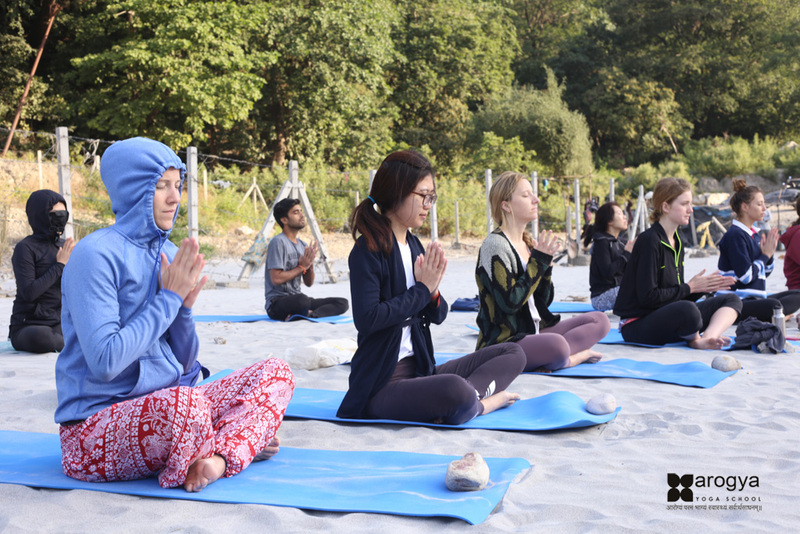 “It is clear that newly admitted UBC students, be they international or domestic, are academically strong,” wrote Ratner. The statement also clarifies that while UBC cannot accept every student that applies, international and domestic students do not directly compete because there are separate admission streams. Farah El-Afifi, president of the UBC International Students Association, said in an emailed statement that the difference in educational systems worldwide actually makes it much more complicated for international students to ascertain what UBC wants from them before jumping through those hoops. “While I understand that what UBC advertises might differ from what it implements, my point is that the barrier to even consider applying to UBC is much larger for international students in terms of the work they need to put in before they get here, the work they need to put in once they’re here … and the work they need to do to keep attending UBC,” she wrote. In his column, Wylie also points to what he sees as “large, unmet domestic student demand” as affecting admissions. “However, for international students, there might be only be a small excess demand relative to supply of seats targeted, so they might get in with grades in the 70s because they are competing in a different, likely less competitive admissions stream,” he wrote. This is also debatable. 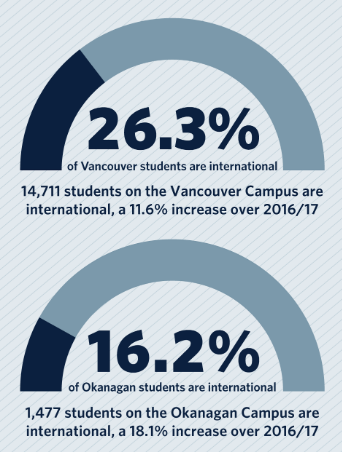 UBC’s 2017/18 Enrolment Report shows that admission rates of international and domestic students at both UBC campuses have been within five per cent of each other over the past five years. While fewer international students apply to UBC, fewer get in — it’s almost exactly as competitive. The Enrolment Report adds that while applications from international students have increased over time, they don’t displace domestic students because they don’t compete for government-funded seats. The province currently funds 42,424 full-time domestic students, and UBC pays for an additional 4,000. 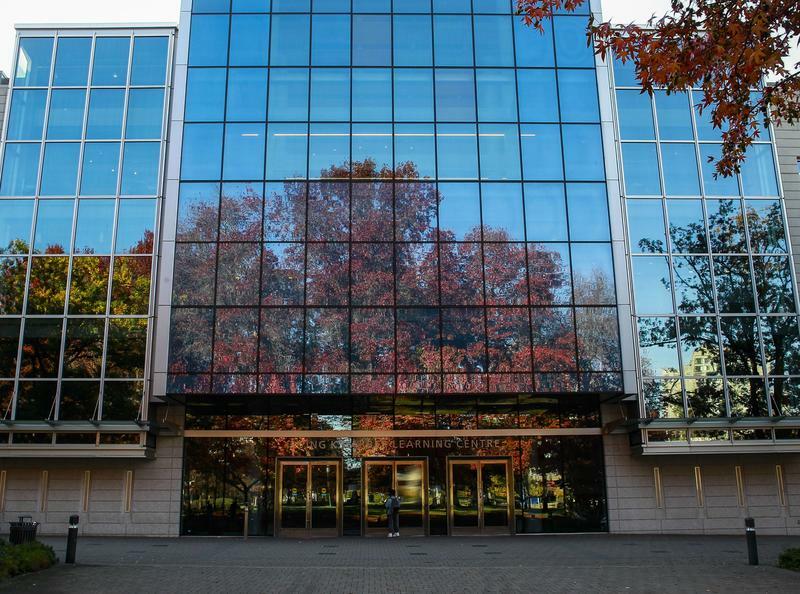 The university credits international student tuition — which almost doubled in late 2015 and has steadily risen each year since then — as partially responsible for its increased faculty and support capacity across both campuses. While the AMS has historically opposed tuition increases, the society agrees with UBC’s assertion of the importance of international students on campus. “Without international students, UBC would not be able to surpass the limitations of provincial funding, enrol 4,000 additional domestic students, hire exemplary faculty and staff and ultimately, create a learning environment that is intellectually enriching for all,” said AMS President Marium Hamid in an emailed statement in response to Wylie’s column. Wylie was unfazed by UBC’s statement. While he doesn’t think that there should be fewer international students at UBC and recognizes that the groups are in different admissions streams, he is concerned that domestic students cannot get seats in certain classes because of the growth in international enrolment. “When a program gets to the point where other international students are 70 per cent of everyone in the program, I think that’s going too far,” said Wylie, referencing UBCO’s economics program and his own classes as examples. He sees more classes and additional seats in programs as potential solutions. UBC says a student’s registration priority is a combination of year level and academic performance, and isn’t related to their country of citizenship. This doesn’t necessarily mean that international students are overall doing better than domestic students once they get to UBC. But it does imply that if Wylie is in fact seeing a majority of international students in his classes, those students might have achieved the highest grades and chosen his class with their earlier registration time. While there may be more international students in some programs, this is likely caused more by preference than by “displacement” of domestic students. UBC has “no data on student performance stratified by citizenship that is readily available,” so there is nothing to show that international students are doing more poorly overall than domestic students. While it’s true that UBC is admitting a greater number of international students, the university argues that it brings only positive changes to the community. This article has been updated to correct an attribution to a comment from Wylie’s email to the online UBC statement that he was quoting. The Ubyssey regrets this error.